Burberry and Twitter have partnered to enable people anywhere in the world to take a photograph from the Burberry Prorsum Autumn/Winter 2015 Womenswear show later today. Any tweets with #Tweetcam and @Burberry Twitter handle will prompt a camera to take a photograph of the catwalk as models strut down the runway. Burberry will tweet each picture back to the user, incorporating their Twitter handle and the time they prompted the camera to take the photo. As part of its fashion week activity, Burberry has also partnered with the Japanese messaging platform Line to make a live stream of the show available to Line’s 180 million active monthly users. 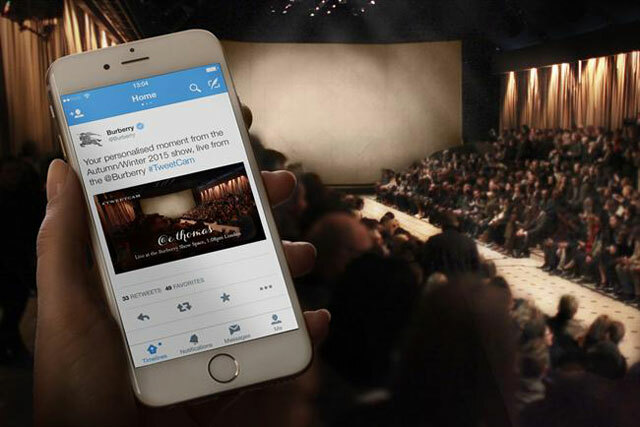 Burberry was the first luxury brand to sell products through Twitter’s Buy Now functionality in September 2014. Other social media activity around Burberry’s fashion week shows has included streaming the runway of the Burberry Spring/Summer 2012 show in Tweet in September 2011. In 2011, Burberry also shared images of its womenswear collection on Twitter using the hashtag #TweetWalk before the items were displayed by the models in the show.